How lively is the second season of the I’m Dying Up Here TV show on Showtime? As we all know, the Nielsen ratings typically play a big role in determining whether a TV show like I’m Dying Up Here is cancelled or renewed for season three. Unfortunately, most of us do not live in Nielsen households. Because many viewers feel frustration when their viewing habits and opinions aren’t considered, we’d like to offer you the chance to rate all of the I’m Dying Up Here season two episodes here. What do you think? Which second season episodes of the I’m Dying Up Here TV series do you rate as wonderful, terrible, or somewhere between? Should Showtime cancel or renew I’m Dying Up Here for a third season? Don’t forget to vote, and share your thoughts, below. 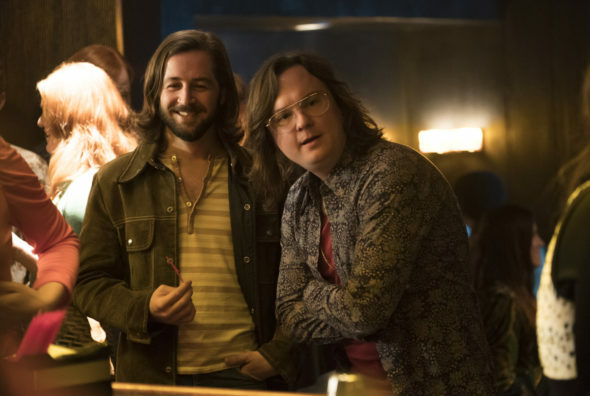 More about: I'm Dying Up Here, I'm Dying Up Here: canceled or renewed? This is my favorite series!!! Please renew! Do not cancel a show of this caliber. It’s mind-blowing when a quality show emerges and it’s threatened by being cancelled. It’s funny, sad, dramatic and totally entertaining. PLEASE renew !!!!! Best show since The Sopranos and Madmen!!! Keep the show going. It’s a great show with great writing! This show is phenomenal: the sense of time and place, interesting characters, great acting. Melissa Leo is outstanding. Please renew for season 3! This is my new favorite series of all that are out there and I’m shocked by it’s lukewarm reception! From the cast, jokes, acting, writing, & all around look & feel of the show during that era, I’m of the belief that the creators, cast, and director nailed it! RENEW this show! I agree this show damn well better get renewed!!! There is so much more to tell. It is a most excellent show! My husband and I stumbled on this show midway during the 1st Season and immediately went back and rewatched it from the beginning. We were thrilled it was renewed for a 2nd Season. The 2nd Season has been phenomenal! Looking forward to the finale tonight and a 3rd Season please!!! Love this show….reason we have Showtime! I love this show! It is brilliant! Acting is phenomenal! Perfectly casted! Season 2 is even better! Please have Season 3! BEST SHOW ON YEARS ! EARLY ROOTS OF COMEDY ON SUNSET STRIO. MELISSA LEO DESERVES AN EMMY☆ anyone attached is SUPERB ☆ Please renew for a 3rd season.